This is the earliest of three settings by Fauré of the Tantum ergo hymn. Set for tenor soloist and five-part choir (the basses are divided), the accompaniment is that most beguiling of French creations—harp and organ. This is church music that borders on the gestures of opera. Fauré often hankered after writing an opera, and there is no doubt that he could have overcome all of the specifically musical problems associated with the genre. 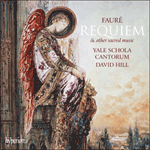 But Fauré’s vocal drama was at its best when understated and delivered to well-known religious texts, as here. Et antiquum documentum novo cedat ritui. Praestet fides supplementum sensuum defectui. let the ancient example give way to a new rite. Let faith make good the insufficiency of our senses. to him who comes from either be there equal praise. Amen.